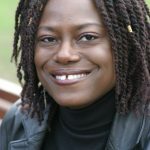 Dreda Say Mitchell is a novelist, broadcaster, journalist and freelance education consultant who describes herself as a ‘complete busybody.” She is the author of five novels, with her debut Running Hot awarded The CWA’s John Creasey Dagger for best first time crime novel in Britain in 2005. Her second novel, Killer Tune, was voted one of Elle’s top ten reads, 2007, and her fifth book, Hit Girls, was voted a top ten book of 2011 by Reviewing The Evidence. She also contributed a short story, The Hotline, for the Mystery Writers Of America’s anthology Vengeance, edited by Lee Child. In 2014 Dreda was selected as one of Britain’s World Book Night authors. She’s also written for radio. She has appeared on BBC TV’s Newsnight and is a frequent guest on The Review Show. She received international praise for her appearance on Newsnight with historian David Starkey, discussing the 2011 UK riots. Over 500,000 people have watched the programme on Youtube. She has also appeared on ITV’s Daybreak, discussing anti-bullying and anti-racist initiatives in schools and been a political commentator on Canadian TV’s Sun News Live. She has sat in for Mariella Frostrup to present Radio 4’s Open Book and presented Radio 3’s The Sunday Feature strand looking at life on housing estates. She has appeared as a guest and commentator on Radio 4’s Woman’s Hour, Saturday Review, Simon Mayo Show, Nightwaves, Four Thought, BBC Radio London and is a frequent contributor on Radio 4’s flagship arts programme Front Row. She has written for The Guardian, The Independent and The Observer, on issues ranging from ‘race’ and class to Phil Mitchell’s drug addiction in East Enders. She was the book judge of The Index On censorship awards, 2007. Dreda was born in 1965 and grew up on a council estate in the heart of London’s East End. Her parents migrated to Britain from Grenada in the 1960s. Her dad was a factory worker and her mum a cleaner at Mile End hospital. Although both her parents left school before they were sixteen they made sure that she and her siblings visited Whitechapel library and this is where her love affair with books started. She continues to live in the East End of London with her partner Tony.